As anyone who owns a smartphone can attest, camera technology has developed considerably over the past 15 years. As this technology has improved, security cameras have become an increasingly common workplace security tool. In fact, they have become cheap enough that most business owners can now buy basic devices that can be installed with minimal effort. Today, security cameras come in all types and varieties, including night vision cameras, wide-angle cameras, variable angle cameras, IP cameras, high-dynamic-range cameras, and closed circuit television or CCTV. While there are a number of varieties of surveillance cameras today, 25 years ago CCTVs dominated the security camera landscape. This security camera system was essentially a security camera that was hardwired to a VCR or other recording device. In most instances, the camera, recording device, and monitor were all located within the same premises and could not be accessed remotely. However, this was not the only drawback. The standard VHS tape could not capture many hours of video and had to be replaced frequently or simply recorded over. Additionally, the security camera systems generally recorded low quality video that could often prove difficult to interpret in the wake of a security incident. Luckily, security camera technology has developed significantly since the CCTV age, and consumers have a lot of options to choose from. For example, wide angle and variable angle security cameras are specifically designed to view wide spaces. 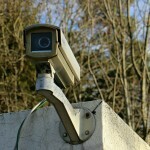 Due to their ability to monitor a large area, they are some of the most commonly employed workplace security solutions. Like wide-angle cameras, IP security cameras have proven popular. These cameras can send and receive information over the Internet, allowing the owner to monitor the video feed from almost anywhere. While IP cameras allow remote access, other technologies have focused on improving quality. HDR, or High-Dynamic-Range, video technology has made security cameras even more effective by providing crystal clear images in all types of lighting environments. Any organization thinking about purchasing security cameras should understand the difference between CCD sensors and CMOS sensors. CCD sensors work by converting light to a digital signal one pixel at a time. One of the benefits of this technology is that it uses a global shutter, meaning that the entire sensor area gathers an equal amount of light at one time. As such, this type of sensor is usually free from the movement distortion that can occur with CMOS. CCD images tend to be of higher quality, produce less noise, and are more sensitive to light. In contrast, CMOS sensors are usually built with a rolling shutter, which means that the shutter starts at one end of the sensor and moves to the other. This can cause distortion with flashes of light or fast movement. This is because the object being recorded actually has time to move within the time frame of the shutter, creating a distortion. However, because the CMOS sensor converts light to data at a faster rate than CCD, they use much less battery power and are cheaper. Individuals and corporations have a wide-variety of security cameras to choose from, and modest investments in these hidden camera devices can do much to improve security. However, organizations should consider discussing with workplace violence consulting experts to understand their security camera needs further. After all, these devices are most effective when deployed alongside other mutually supporting security assets. The IMG Group is a leading workplace violence consulting firm, with considerable experience in physical security. Corporate or business organizations concerned about their need for detailed international security management planning can reach out to the IMG Group for assistance. The company’s expert security consultants provide services such as international security consulting, executive travel security, corporate risk assessment, workplace violence consulting, crisis management consulting, supply chain security and more. Previous Post Security Certifications: Important for Career Success?